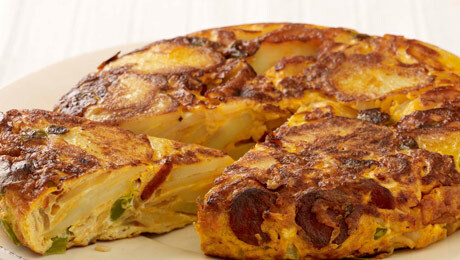 This is my take on the classic Spanish omelette. I have added peppers to this recipe and the quintessential Spanish ingredient - chorizo. Dry the sliced potatoes well in a clean cloth. Add onions, garlic and potatoes and continue to cook for 8-10 minutes until the potatoes have softened a little. Transfer the potatoes from the pan into a clean bowl. In a separate bowl whisk together the eggs with the diced pepper and chorizo, add the potatoes and return the entire mixture to the pan and cook over a low heat. When it looks set on the top, and there is very little liquid egg left place a plate on top of the pan, turn it over and return it to the pan and continue cooking for another couple of minutes. Mix the lettuce, tomatoes and onions together.